The Orbit Tower was designed for the Olympic Park by British-Indian sculptor Anish Kapoor and it’s now open again for visitors since last week. It is one those structures that gets the blame for spoiling the London skyline. On the other hand each high rise building in London seems to get accused for the same reason anyhow. Especially in Stratford it must be recognized that there wasn’t very much of a view without it to begin with. 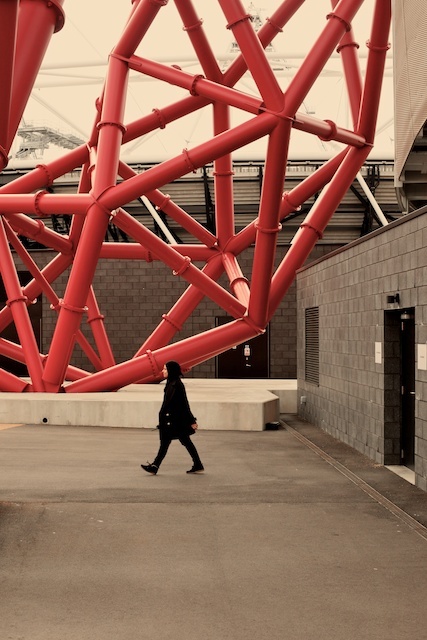 The bright red steel structure could only brighten up the grey London skyline. And as with any piece by Anish Kapoor it’s more about experiencing and immersing yourself with the work, than just looking from afar. Of course going up to view the surrounding landscape can be slightly disappointing as there isn’t that much to see yet in the area. But the structure itself is beautifully engineered. After all it was created by an artist with real insight into spatial experience – whose work exemplifies the idea of ‘sculpture in the expanded field’. With the Aquatics Centre pool by Zaha Hadid now open and the tower by Kapoor, the Olympic Park has real potential to become a recreational space with sculptural elements of the highest aesthetic quality. Still some way to go, but with plans for the urban meadow land and other elements it could well be an example of how to reinvigorate the Olympic park after the games.